In an earlier article, Genealogy 101: Death Certificates, we discussed where and how you can access death certificates for an ancestor. But it’s not enough to just find the death certificate. We need to also analyze it to better understand what information it’s providing and where we should look next. Those are important facts, but what else can a death certificate provide? Death certificates are unique documents in that they contain what genealogists call primary and secondary information. Meaning: the information found on that death certificate is from those who had firsthand knowledge (primary) of the details they provided (the death date and place provided by the attending physician, for example), and those that did not have firsthand knowledge (secondary) regarding the information they provided (like a spouse providing her husband’s birth date and place). Information provided by someone not party to an event – secondary information – can be suspect because they do not have firsthand knowledge. But to be honest, the primary information provided on a death certificate may also not be accurate, for various reasons. Let’s look closely at a death certificate and see what it tells us. Photo: death certificate for Frank Nikolaus, Jr. Credit: Gena Philibert-Ortega. One of the first things we notice on the left-hand side of the certificate is that he had lived in Arizona 17 years and 9 months – in other words, his entire life. His date of birth is given as 1 November 1892 – but it’s a good idea to verify his birth with a document that is either meant to record births, like a birth certificate, or one that recorded the birth around the time of the event, maybe a family Bible. You might also notice that his father, Frank Nikolaus, is the informant for some of this information. Assuming he was present at his son’s birth, the information about his birth should be accurate. However, keep in mind that at the time he provided information for this death certificate his teenage son had just died unexpectedly in an accident. One can only imagine the emotions he and Frank Jr.’s mother were going through, so that information provided shortly after his death could include an error or two. Parents’ names on death certificates can be problematic at best, with the mother frequently listed as “unknown” – but in this case, the father was giving the information so all the personal fields are completely filled out. Note that the father’s birth place is listed as “foreign” so we don’t get an exact location for his birth (further research reveals he was born in Germany), while the mother, Mary Elizabeth Laxton, is listed as being born in Utah. Frank Jr.’s death was caused by being thrown from a horse. The death certificate lists that clearly. But there aren’t any other details about this death. Now you may have also noticed that someone wrote “176” in pen or pencil below the cause of death. You might have seen these handwritten numbers before on death certificates for ancestors who died after 1900. That number is from the International Classification of Diseases (ICD). It’s helpful to put our ancestors in historical perspective – for example, in the 19th century death certificates throughout the nation were spotty at best, as was a means of consistently reporting the cause of death. The adoption of a uniform code for causes of death was important, allowing those in public health circles to accurately provide data on deaths and see trends. Jacques Bertillion (1851-1922), the chief of Statistical Services in Paris, developed a code that was eventually adopted by other countries. In 1897 the American Public Health Association recommended that “the Bertillion classification of causes of death be adopted by the registrars of vital statistics in the United States, Canada and Mexico.” (2) This was an important step at a time when not all states recorded deaths, and census mortality schedules were less than accurate. You can find a list of diagnoses to match the ICD number found on a death certificate at Wolfbane Cybernatic. On this website you can look at the ICD codes according to year, starting with 1900. Choose the link for the code nearest the date your ancestor died. In the case of Frank Jr., he died in 1910 so I chose the ICD 2 which was published in 1909. Frank Jr.’s code of “176” is listed in the ICD as “Injury by Animals” which doesn’t provide much information beyond what we already knew, but consider if your ancestor died in 1918 from the flu pandemic. They may have a death certificate with a general cause of death obscuring the fact that they were a flu victim – but the ICD code might specify “10” which was influenza. What else do we learn from Frank Jr.’s death certificate? We learn he is buried at “Adair” cemetery near his home. Online research provides information about the cemetery and a photo of Frank Jr.’s tombstone. So, what are my next steps in regards to this death certificate? I have Frank Jr.’s death date, death place and cause of death, as well as his birth date and his parents’ names. But in this case, there’s more to this story than the certificate provides. For example, I’m still curious about the details of his death. A newspaper account is an obvious step to take. A search for a newspaper account in GenealogyBank’s Historical Newspaper Archives only provided hits for his father. However, a Google search provided a result from Google Books for the Images of America: Show Low (Arizona) book which states on page 33 that “In 1910 Frank Jr. was killed crossing Show Low Creek when his horse slipped and fell on him.” (3) That page also provides a photo of Frank Jr. as a child. It’s possible that this small community or nearby towns may have resources that should be researched in-person at a local library or historical society. It might also be worthwhile to contact family members from that branch of the family to see if any other stories have been passed down about this unfortunate accident. Who was the informant/s and how much information would they have known firsthand? What does this document not tell me, or what is missing? What records can I look for to verify or learn more about this event? Finding a death certificate for an ancestor helps our research, but analyzing that certificate can help us better understand what the certificate is telling us and where we need to go next to answer our research questions. 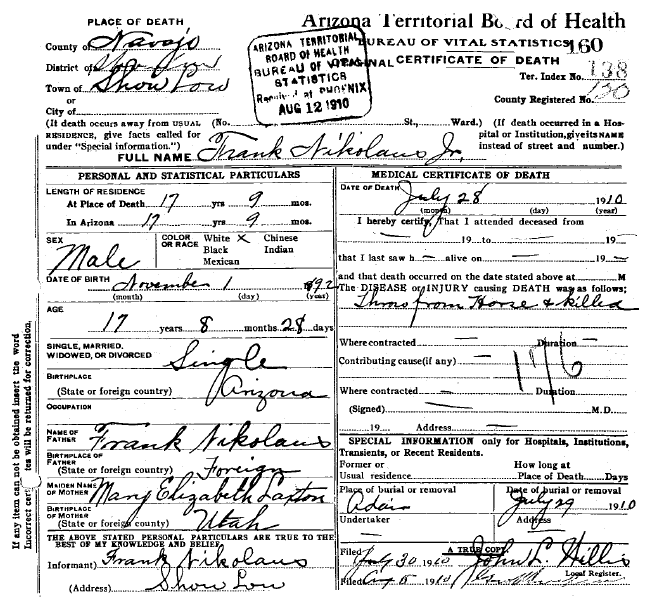 (1) “Frank Nikolaus Jr,” Arizona Department of Health Services (http://genealogy.az.gov/azdeath/009/10090718.pdf: accessed 24 August 2018). (2) American Public Health Association. The Bertillon Classification of Causes of Death. Lansing, Michigan: R. Smith Print. Co, 1899, page 5. (3) “Show Low,” Google Books (https://books.google.com/books?id=XiPimWUspwQC&lpg=PA33&ots=xkPCJCaQ1Z&dq=%22frank%20ludwig%20nikolaus%22&pg=PA33#v=onepage&q=%22frank%20ludwig%20nikolaus%22&f=false: accessed 24 August 2018). Thank you for this new window to further resources. I figured out a little of how to glean info from death certificates on my own, and looked for obits using that data, though not always successfully. I didn’t know about the ICD codes. You’ve shown me how to open new avenues of research, including your bibliography of sources. Very helpful! The biggest take away I got was the “written” in code — 176. Thanks! Good analyzing -– reminds me to be thorough with all certificates. Thank you! Very interesting. I am new to genealogy and find these articles extremely helpful.